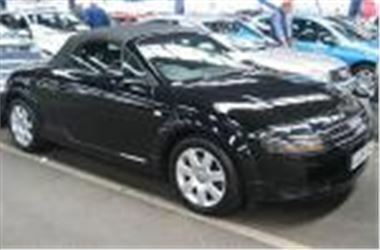 Today’s jaw-droppers included this 17k mile completely standard 04 reg Audi TT 1.8T 150 Roadster. New, they originally sold at £20k at a discount. But Glass’s books an 04 with 16k at £16,525 and, being the silly season, this one went over book to sell for £16,850. A 35k mile 03 reg A4 1.8T Sport cabrio then promptly made £19,550. And a 23k mile 2004/54 A3 TDI 140 DSG S-Line sold for £17,100. An apparently unique 17k mile 04 reg Alfa GT 2.0JTS Selaspeed (the only one in the country with satnav) sold for £16,800. (Check out Week’s Best Deals on this website to make sense of that.) An old shape 58k mile 03 reg SAAB 9-3 Aero convertible sold for £13,900. An 11k mile 02 reg MGTF 1.8VVC 160 sold for £7,350. Even a 43k mile 02 reg Rover 75 Connoisseur 2.0CDT Tourer rallied to sell for £7,200. Highlights of the huge RFS section were an Inferno red 8k mile 04 reg RenaultSport Megane 225 which sold for £13,300, an 18k mile 04 reg Grand Scenic 1.9DCI 120 Expression which sold for £10,600, a 9k mile 2004/54 Modus 1.4 Expression which sold for £6,950, and a 16k mile 2004/53 Megane 1.6 Dynamique Coupe Convertible which sold for £12,150. The one and only Vel Satis, a 352 mile 02 reg 3.5V6 Privilege bid to a mere £6,950 provisional. In the Mazda section 2004/54 reg Mazda 6 1.8S 5-drs with 11k – 14k miles were bidding to £8,400; 2004/54 reg Mazda 6 1.8TS 5-doors with 11k – 14k were selling for £9,675; and 2004/54 B-Series 2.5 4-Action Double Cabs with 4k – 9k miles were selling for £10,050 to £10,250 + VAT. Not many cheapies today, but a 55k mile 97R Rover 420SLI obviously was for just £600. The big event on Monday 11th July is a sale of 125 convertibles from Lloyds TSB autolease, plus a section of Black Horse Finance repossessions and the usual Top Car sale.